In two days (19th May) the UK is going to celebrate the Royal Wedding of Prince Henry of Wales (or Harry, as he is more popularly known); Princess Diana’s second Son. He is marrying actress Rachel Meghan Markle at the St George’s Chapel in Windsor Castle where the Queen and Prince Philip live for most of the year. I will not get into any details about their wedding as the media has been and will be covering the event extensively and in every minute detail. On the days prior to and on the wedding day, I expect the town of Windsor will be completely taken by government officials, security personal, diplomats, rich people, not so rich, but curious people and tourists, so for me in particular Windsor is a “no go” destination in the period. Thankfully, the 7th of May was a bank holiday in the UK and it was a gorgeous day. The sun was shining, the skies were clear and the temperature was ideal for a bike ride. So, as I mentioned the royal wedding at the end of the video, I decided to call this ride the “Royal Wedding Ride to Windsor Castle” and I took the opportunity to start it from Bracknell’s, new town centre, called “The Lexicon“, so I could show it to you all as well (the old town centre was demolished a few years ago to give way to the construction of The Lexicon, an investment estimated at approx. £750 million). On the 19th of July 2015 I published a post containing a 9 min 37 sec time-lapse video starting from Bracknell’s train station, but using a different route which takes me by the entrance of the Legoland Park in Windsor and then through some private roads of a farm which I suspect belongs to the crown. On the 20th of September 2015 I published a post containing a 1h long video in “normal mode” of my ride from my home in Bracknell to Windsor Castle. On this post I also published a 10 min video of my walking around the centre of Windsor starting from Windsor Castle where the video above stopped. On the 18th October 2015 I again posted another post of a mid-autumn bike ride to Windsor containing the video of the ride from Bracknell to Windsor and the way back from Windsor to Bracknell . The first video is only 2 min and 31 sec long as it was a 5 second interval time-lapse recording. I did use the same route and rode from home to the old Bracknell Town Centre, but on my way back to Bracknell, I used the same Legoland Park route as on the post of the 19th of July one. On the 8th of February 2016 I published a post containing 2 videos: An 8 min and 37 sec time-lapse video from Bracknell’s South Hill Park, using pretty much the same route as the one I used in this post, and also a video of the way back to Bracknell , using the same Legoland Park route as on the way back of the above post. These post show only the rides to Windsor that I recorded. The distance between my home to Windsor is, for me, the perfect training length and I have often also used Windsor as a destination to do “full load” test rides in advance of long touring trips such as the one I did to Rome in 2016. I speak most of this introduction on the video below, so if reading is not your thing, feel free to watch the video and skip the words. In September 2017 I completed by bicycle the 571 Km (357 miles) of the Faith’s Way, or Caminho da Fé in Portuguese, which for me turned out to be about 600 Km due to my choices and mistakes. The Caminho da Fe is sometimes also known as the Path of Faith. My route along the Faith’s Way from Sertãozinho to Aparecida do Norte. The Faith’s Way is a pilgrimage route in which the pilgrims may choose to start from different locations, depending on the distance they want to cover. I decided for the longest route starting in the small town of Sertãozinho in the State of São Paulo. Regardless where pilgrims start, like in the pilgrimage of the Santiago de Compostela, the destination is always the same: In this case, the Catholic Basilica of the Sanctuary of our Lady in the town of Aparecida do Norte, also in the state of São Paulo. I am posting this introduction mainly for those who have never heard of this pilgrimage route, but also for those who may already have heard of it, but have not attempted to do it yet. The English version of this post will be rather different than the Portuguese one. Reason being is that there is already a great amount of information available in the web about the Faith’s Way, but mostly in Brazilian Portuguese. So, while for Portuguese speakers I can just point them in the right direction and provide them with the web links, in English I think I need to provide a little more contextual information to improve understanding and be worth your time. If you can, however, read in Portuguese, a good point to start is the web site of the Friends of the Caminho Association on www.caminhodafe.com.br. I’ve been told that the English version of their page is in the works though. There are also numerous online groups (Facebook, WhatsApp, etc) where thousands of pilgrims and pilgrims to be can exchange information and provide virtual help and support. Again, I am unaware of the existence of such groups in English Language. Please leave a comment below if you would like me to create one. The Faith’s Way, or the “Caminho” was the brain child of 3 Brazilian Compostela pilgrims, who, after having completed the pilgrimage in Spain a few times had the idea of creating a similar pilgrimage route in Brazil, linking their home town of Águas da Prata (which translates to Silver Waters in Portuguese) in the State of São Paulo to the Sanctuary in Aparecida. The Sanctuary in Aparecida had been a pilgrim destination for generations already, but there wasn’t up to that point an organized pilgrims’ path with hostels and support along the route, as there is on the Camino de Santiago de Compostela. By sharing my experiences on the “Caminho” my goal is to help spread the word of this pilgrimage route outside of Brazil and, perhaps, help those who may be interested in walking or cycling the route, by showing them what to expect along the way, at least if they chose to do the same route and in the same weather conditions I did mine. Please help me achieve my goal by clicking the “Like” or the Thumbs-up button in YouTube, leaving your questions and comments and sharing this post with others who might be interested in these types of adventure or alternative forms of traveling. Together with this post I have also published a short interview with Mr Almiro Grings, the creator of the Caminho. I recorded the interview during my passage at the Friends of the Caminho Association, which also doubles as a pilgrims’ hostel, in the town of Águas da Prata, when I got there during my pilgrimage. The video is in Portuguese with English subtitles. Well, those that follow this blog will know that the Caminho is not my first long distance cycling pilgrimage. It is in fact the 3rd one. In 2015 I cycled the 820 Km of the Camino de Santiago de Compostela from the French town of Saint Jean Pied de Port (known as the French way) and in 2016 I cycled 2,048 Km from the English town of Canterbury in Kent to the Vatican City in Italy in a pilgrimage route known as Via Francigena. It is honestly not that easy to explain in detail why, in the past 3 years, I have been doing this because everyone was different, but the most simple and concise answer would be: I like the Physical and mental challenges and also the opportunities of introspection that such long bike rides allow, which are actually quite similar to those walking the way, but obviously not as time consuming. Because there was a certain logistical advantage for me personally to start the pilgrimage from there. There is a direct bus connection between the small town I was living, at that time, in Brazil and the city of Ribeirão Preto in the state of São Paulo. Ribeirão Preto is situated just 20 Km (13 miles) away from Sertãozinho and therefore I would not need to change buses (which I ended up doing anyway, but it was beneficial and not as complicated as I thought it would be). A plus if you are carrying your luggage plus a dismantled bike with you in the bus. Because the route starting from Sertãozinho was, at the time I did it, the longest path to the sanctuary of Aparecida and I was keen to spend more time on the road. 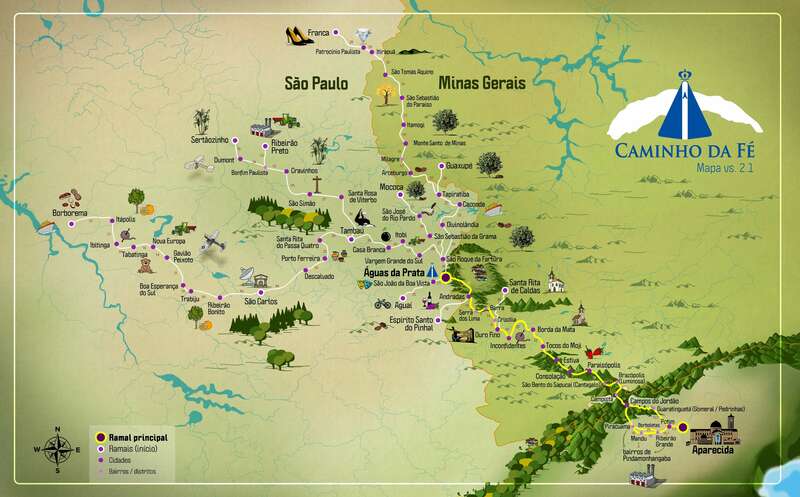 If you look at the map of the Caminho, available for download from the web page of the Friends of the Caminho Association, you’ll see that you may start your pilgrimage in in many of the so called “branches” of the route or in most towns / places along the way. The key to starting your pilgrimage and officially becoming a pilgrim is the pilgrim’s credential which you’ll find in many (but not all) places along the way. All branches combine in Águas da Prata, which was where the Caminho was first created and from there the route to Aparecida follows the original path. I already published all my experiences on the Camino de Santiago in 2015 in the EyeCycled blog and in the YouTube channel, but I am still working on the posts and videos of the 2016 Via Francigena pilgrimage to Rome. With this post I am starting the pilgrimage posts and videos of the Caminho da Fé which will follow the same basic principles of previous pilgrimage posts. As my goal is to show how my pilgrimage developed, I typically turned the camera on at the start of the day’s journey and turned it off when I reached my destination for that day. By reading or watching my experiences, future pilgrims can perhaps use them as a guide and decide to follow the same route I did, or not. As no one in their right mind would watch several hours of cycling videos, I recorded the entire journey using a type of video recording called “Time-Lapse“. In this type of recording the camera takes a high resolution picture (4k) every 0.5 seconds and internally builds a video with them at the end of the recording. This makes the video look very accelerated in time. In fact, each 10 minutes or so in real life represent about 10 seconds of video footage, so it is possible to watch an entire day in the journey in just a few minutes without missing a single meter of the track. The disadvantage of these types of recordings are, obviously, the speed in which everything is shown and the vibration of the camera which in an accelerated speed is much more pronounced and notable. This can be reduced with a device called a Gimbal, whose function I already explained in a previous blog post and videos in the channel. The Caminho was the 1st time I used this device in a consistent manner and for long distances and periods of time. Although the gimbal helps reduce the effects of the vibration it does not eliminate them completely, due to the potholes, stones, gravel and uneven surfaces of the path, mostly on dirt roads and footpaths. My intention is to publish posts and videos about the Caminho da Fé every two weeks, but I already know this may be just wishful thinking due to upcoming periods of intense travel and work. If you look at the map of the Caminho again, you’ll see that between Sertãozinho and Aparecida there are 21 major tracks. My intention is to publish a time lapse video for each one. I also want them to be bilingual, so current expectations are that I need to produce at least 42 videos, not counting this introduction video and other, shorter videos I recorded along the way. This also added to the fact I will publish 1 blog post for each day of my journey in English and Portuguese as well, containing pictures, tips and highlights, so I am not making promises I won’t be able to keep. It will be done when it’s done, regardless of how long it takes. One could say, there is a reason it is called this pilgrimage is called “The Faith’s Way”… having faith in yourself in generally a requirement. I have faith I’ll complete this work and count with your support in doing so. I don’t do this work expecting a financial benefit in return, but I have costs to maintain the blog, such as hosting and domain reservation, and this work demands a lot of my time. In fact, it takes me a lot longer to do this as it did take me to ride the entire way, so if you are feeling generous, please go to me Patreon page through which you can contribute with a small donation to help maintain the blog running with coffee to keep me going late nights. The following video interview was recorded at the Friends of the Caminho Association in Águas da Prata in September 2017. The Excel file below contains the statistics of the journey (as collected by my Garmin Edge 810), such as distances, Elevation, Speeds, Average Heart Beat, etc, as well as the expenses, accommodation and the notes I recorded along the way. I decided to write a little about how I got to the starting point of the pilgrimage, not because it may help you direclty, but because it may get you to understand the logistics of getting to the starting point. As previously mentioned, I had to find a way to get to starting point of the pilgrimage, which I chose to be the town of Sertãozinho in the federal state of São Paulo. I was living in a small town called Jataí, in the state of Góias at the time. If you live outside of Brazil you will probably start your journey from a much bigger city, likely a capital and will have to find your own way to get to the starting point. There are buses from the city of São Paulo directly to Sertãozinho and flights to Ribeirão Preto, which is just 20 Km away from Sertãozinho. I tried in vain to find somewhere who had a car and wanted to share this adventure with me, but it is hard to find someone with the willingness to do it and, most importantly with the time, which is a significant length of time away from work, family, etc. Our bus was stopped by the Federal Highway Police at the station near the city of Uberaba in the state of Minas Gerais. As I couldn’t find anyone, I started to look at the options of getting to Sertãozinho from Jataí. Jataí is a small town and doesn’t have an airport the offers regular flights. Sertãozinho is also a small town, but quite near from a bigger city called Ribeirão Preto. Ribeirão has a regional airport with flights to/from a number of destinations, including the capital of the state of Goias, Goiânia. The problem is that a trip to Goiânia is 320 Km and would have to be made by bus anyway, so as there was a directly bus connection from Jataí to Ribeirão Preto, I decided on this option. It would be a longer and less comfortable journey, but it would be direct and cheaper also. I spent R$ 135.00 on the bus ticket. The distance between Jatai and Ribeirão Preto was 715 Km, but the journey, which should have taken about 12h, was delayed for more than 2h at the station of the Federal Highway police in Uberaba, state of Minas Gerais, as they stopped and searched to bus due to an apparently anonymous tip-off they received that someone in that bus would be smuggling drugs to Sâo Paulo and the tip-off proved to be right. They found the smuggler together with 10 Kg of Cocaine Paste. Expect the unexpected! In Ribeirão Preto I had to option of assembling the bike and riding the 20 Km to Sertãozinho, which I was advised against due to some areas of high incidence of crime I had to go through, or take an urban bus from Ribeirão Preto to Sertãozinho. As I arrived at Ribeirão Preto’s bus station, I asked around and found out from which platform the bus to Sertãozinho was departing. I had to take the lift downstairs, turn left, walk a few meters and take another lift upstairs to the platform where the local buses departed. The bus to Sertãozinho was already there and was about 3/4 full. Me, in the bus from Ribeirão to Sertãozinho, seating in the seat usally reserved for disabled passengers and holding the bike upright. The problem was that that bus was a urban type and had no boot or facilities to carry bikes, so the driver told me to seat in the seat reserved for disabled people and hold the bike upright. The journey to Sertãozinho was short, about 30 min. Upon arriving at Sertãozinho’s bus station, I assembled the bike and rode to the hotel (about 1.5 Km away). Did the check-in in the Agapito Hotel, the only hotel in the official list of accommodation of the Friends of the Caminho Association, and got my pilgrim’s credential. In the evening I met with a TV crew from Globo TV, Brazil’s largest TV network.I knew they were coming as I was told by the hotel receptionist when I called to make my reservation a few days before. We went out for a meal that evening, talked about a lot of things, incl. my previous pilgrimages and agreed on an interview in the morning the next day. The "Faith's Way" (Caminho da Fé). it gives me great pleasure to announce to you all that next week I will start my 3rd Christian Pilgrimage by bike. It’s called “Caminho da Fé” which literally translated to English means “The Faith’s way”, but it is also sometimes translated as “The walk of faith”. This pilgrimage route is now considered to be the Brazilian equivalent of the way of St. James or Camino de Santiago, which I’ve done in 2015. 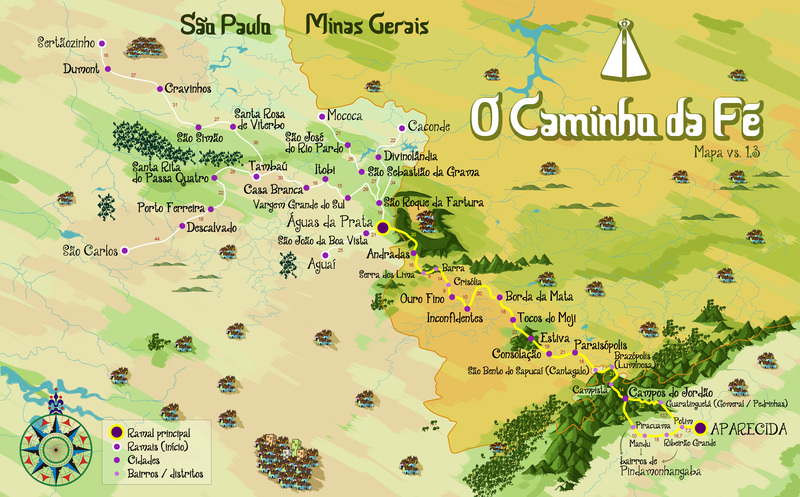 There is extensive material about the “Caminho da Fé” on the Internet, but in Portuguese only. I could not find much in English, so the English version of this post will be more detailed than it’s Portuguese one, so to give you guys more background information of what the pilgrimage is all about (most links on these page will open to English Language resources though). Brazilians have been walking to the Basilica of the National Shrine of Our Lady of Aparecida for generations. Many to fulfil religious promises (i.e. to obtain a cure for some illness or for other types of graces), others for cheer devotion. With 18,000 m2 (190,000 sq ft), the basilica is the 2nd largest catholic church in the world losing only to St. Peter’s Basilica in Vatican City. I’ve chosen the longest path, starting from Sertãozinho, not necessarily because I want to ride more (although this was one of the reasons), but because of logistics. There is a direct bus from my current whereabouts to Ribeirão Preto, a city only 20 Km from Sertãozinho, so I only need take 1 bus journey (of 12 h though) to get to my starting point. My entire journey will start on the early hours of Sunday, the 18th of September, with the bus to Ribeirão Preto. From Ribeirão Preto to Sertãozinho there is a short distance of just over 20 Km, perfectly doable by bicycle, but I’ve been advised to avoid this track because it goes through some high crime areas between the 2 towns (in Brazil, unfortunately, this is a constant worry). So, as I arrive in Ribeirão Preto I may take yet another bus journey, a short one though, to Sertãozinho, or, if I am feeling adventurous, ride my bike (generally speaking armed thieves steal the entire bike with everything on it, and on the rider… it would be a shame if my pilgrimage was to end before it could even begin though). In Sertãozinho I will overnight in the Agapito Hotel, one of the few places where you can buy the pilgrim’s credentials, which, exactly like in the Way of Saint James, you will need to stamp along the way in order to obtain the certificate of completion as you arrive in the Basilica in Aparecida do Norte. From Sertãozinho I’ll let faith take me (no pun intended). I was going to purchase the excellent “Caminho da Fé” guide (link in Portuguese only) from Antonio Olinto, but I didn’t get to do it, so I will simply follow the yellow arrows (another thing copied from the the way of St. James / Camino de Santiago). My two previous pilgrimages experiences taught me a lot and minimised a number of fears I had before I started. This one, in Brazil, is a bit different than the previous two as it introduces the fear of being victim to the social / economic situation of the country. Not that being a victim of crime isn’t a possibility during the Camino de Santiago where even murders of pilgrims are know to happen, but it is a question of the likehood of it happening, which in Brazil is much higher than in countries of the European Union. The good thing about starting my pilgrimage on the 19th of September, though, is that I apparently will not be doing it alone, as I originally thought I would. I found out today that a crew of the Brazilian TV network “Globo” will be recording a program about the “Caminho da Fé” and that the main reporter, who I had the pleasure of talking to on the phone today, will also be riding on a bike all the way to Aparecida, supposedly followed by his TV crew. Who knows, I might even appear on the telly, which is an unexpected surprise. Life does have a way to surprise you, if you give it a chance. As usual, I will try to post as much as I can along the way, but experience has thought me that any posts are more likely to happen on the EyeCycled Facebook page than on the blog. So, please, if you have not done so yet, and would like to follow me on this little adventure, make sure you like the page. If you’ve seen my previous post, you’ll be aware that I recently lost a “non-human” friend, my trusted Dell XPS 15 notebook, which I used to edit the videos for the YouTube channel and create content for the blog. As with previous pilgrimages, I fully intent to cover the entire route of the “Caminho da Fé” with time-lapsed videos and bring as much info and media to you as possible. Without a proper computer that might take awhile though, but don’t give up on me. Like “Arnie”, I’ll be back! PS. If you can read in Portuguese, the site of the AACF (Friends of the “Caminho” Association) is an excellent source of information. I am working on writing Via Francigena content, editing the videos and sharing this experience with you, but progress has been slow due to life’s demands. Please, subscribe to be informed of new post or like our Facebook page. On the 12th of August 2016, the 14th day of cycling between Canterbury and Rome, I completed the 1st 1000 Kms of daily bike riding of my life. I know, compared to cyclists that cycled around the world, some of which with 100s of 1000s of Kilometers in their Odometers, just is just a drop in the ocean, but for me it was a pretty special moment in a nice location. New challenges are definitely on the horizon. Via Francigena Charity Bike Ride, in aid of Mind UK. If you have been following my blog or Facebook page, you will know that I am soon going to be undertaking my biggest bike ride yet, a 2,000 Km long (approx.) 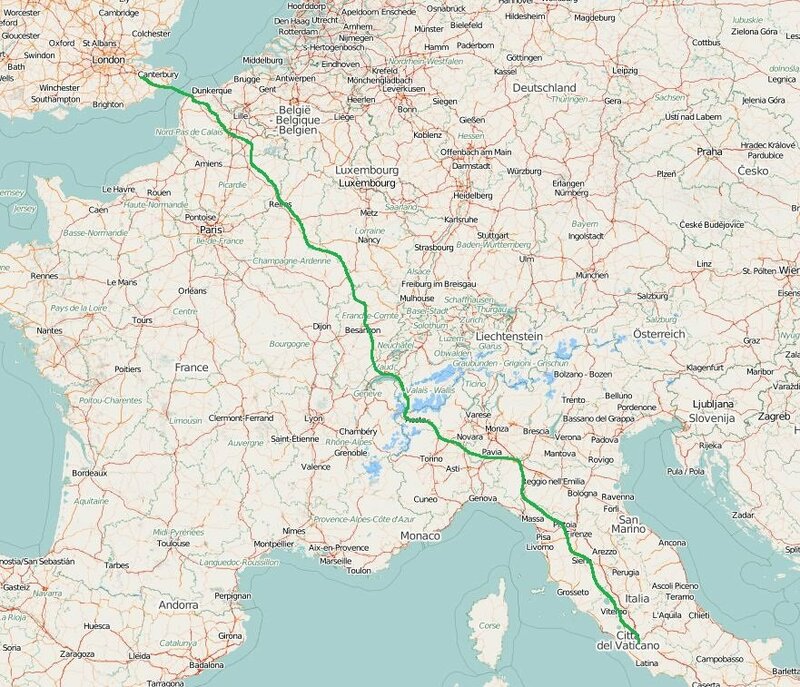 bike ride from Canterbury in UK to Rome in Italy, on an ancient pilgrimage route known as Via Francigena. My motivations for doing this bike ride are many, some of which are quite obvious and some are not. On the obvious side, you may have followed my series of blog posts about the Camino de Santiago last year. The Via Francigena is a natural step up from that as it is 2x as long and not as well structured as the Camino (what I mean is that there aren’t as many pilgrims’ accommodations along the way and the route is not well sign posted, especially in France). As for the non-obvious reasons, I feel strong enough now to share at least one with you all. Since the very unfriendly break-up of my marriage, some 15 months ago, I’ve been battling on and off with depression. I took antidepressants for a few months and gone through therapies. Depression is an odd kind of illness… Due to sheer ignorance, like many I had a very stigmatized view of it. To be honest, of any type of mental illnesses, actually. I truly thought it was sort of a rich people’s sickness. An illness that affected only those people who had too much free time on their hands. Life has a funny way of teaching you things sometimes. So, imagine my surprise when I started to notice very physical symptoms caused by anxiety and my general mental state. Among others where teeth-grinding (also known as Bruxism), sleeplessness, difficulty to breath and more. Life hadn’t stopped, of course, and there were still bills to be paid and things to be done, which at times, associated with loneliness gave me the real feeling I wouldn’t be able to coupe anymore. Went to the GP several times and he confirmed the diagnosis of clinical depression. It was somewhat interesting to understand how your mental state can have such a powerful impact on your physical condition and I am not talking here about normal day to day worries most people have with their children, their financial affairs, their jobs, etc. This is not a learning experience I wish anyone to go through, but it is generally hard to choose not to be depressed when you’re affected by certain life circumstances, which can vary of importance from person to person, especially when there is so much negative going on in the world these days. Depression is usually a package. In extreme cases, for some the easy way out appears to become the only solution (even though it is clearly not) and it may surprise you to know that suicide remains the leading cause of death for men between 20 and 34 in England and Wales, representing 24% of all deaths in 2013, and for men aged 35-49, at 13% of deaths (source: The Guardian). Thankfully the ultimate act was never an option for me… not that I didn’t occasionally think about it, but I’ve always considered it a very unlikely outcome for me in particular. I value my life and the life of others way too much and I personally don’t think ending your physical existence ends the mental problems you might be facing (I believe in “life” after death). Needless to say this condition had an impact not only on my personal life, but on my professional one too. I don’t subscribe to the idea that a person can fully compartmentalized his personal and professional lives. An unbalance in one, will have repercussions in the other. The drug I was taking didn’t appear to be making much of a change, although it did help me sleep at night (helped even a bit too much at times as it made it a lot harder to jump out of bed in the morning as well), and when my GP suggested the prescription of a more powerful drug I took the decision upon myself to try to beat this thing without chemicals (or artificial ones, at least). Cycling has been “my thing” for quite a few years now and it was only natural for me to turn to cycling as a means to combat my depression. Convincing my bosses to give me a 42 days holiday was a tough sell, but I manage to do it and here I am, just a few weeks from starting my cycling pilgrimage. So, what I am trying to prove to you, in case you don’t already know, is that, if you know someone who suffers from a mental illness (or if you experience or have experienced it yourself) a drug-free treatment through physical activity can be a powerful boost to your well-being, not to mention a big reduction of the cost to businesses and society overall, given that antidepressant use has doubled in England over the past 10 years (source NewScientist). Most concerning is that the number of children prescribed with antidepressants have increased by 50% in 7 years (source: The Independent). A US study has estimated that about 300 million work days are lost to sickness every year with 56% of employees reporting depression and anxiety as a cause. Not even the most cold-hearted business person can ignore these stats. That is why I converted my solo bike ride to Rome into a charity event and have partnered with Mind UK, one of the UK’s leading Mental Health charities, on this enterprise and am here asking for you to donate some of your hard earned cash to this cause. I know how hard it is to try to get out of a bad situation alone and sometimes you need someone that can provide you with an independent perspective about your situation. £500 can keep Mind’s legal advice service open for a day helping people understand their rights and receive practical legal advice on mental health issues. What Mind has achieved in 2015. Click on the image to read MInd’s annual review document for 2014-2015 (PDF reader required). I believe the best thing to combat depression is to try to live life to the fullest. What that means changes from person to person. To live life to it’s full potential will likely be related to finding a job or work that is fulfilling, having a loving family relation, good friends, include hobbies and physical activities and help those you can, through volunteering or other social efforts in benefit of those in need. During a recent well-being course, I was shown how to graphically represent life as a boat. If you divide your boat only between work and family chances are that if one of them isn’t going well your boat will have more trouble to stay afloat than if you are able to divide your life’s boat in more compartments. Which one do you think is more likely to stay afloat? Cycling has been one of these compartments for me… it’s a low impact form of exercise providing an increased cardiovascular fitness as well as a good muscle workout, as it uses all the major muscle groups as you pedal. It is excellent in reducing obesity and controlling weight and while you are on your bike your stress levels seem to fall dramatically even when you are thinking about your problems which automatically leads to a reduction in anxiety and depression. But if cycling is not your thing, just pick something else… There is plenty to choose from. The important thing is that you don’t give up. If you allow me to suggest a strategy, rather than choosing something cheap and easy just to “try it out first, to see how it goes”, go the full mile. Choose something you think you will like (inform yourself) and go buy the gear for it. Do not buy the cheapest! Generally speaking people don’t like to waste money. Generally speaking, you get what you paid for. Buying good quality gear will enhance your experience and help you transition into it more easily, with less efforts and pain. Of course, this is not for everyone, but keep in mind managing limited resources are very much a question of priorities. If you are ill, getting healthy should be one. As Mr Spock would say, it is illogical to want to remain sick! To contribute to this cause, please click on the Virgin Money Giving page below (just in case, nothing of your contribution is given to me). (suggested amount = £2.00 or USD $3.00 or 2.50€).